Inverbervie, often more simply known as Bervie, lies on a raised beach behind Bervie Bay, just to the south of where the River Bervie flows into the North Sea. It was already well established as a fishing settlement in 1341 when King David II and Queen Johanna were forced by bad weather to land just north of here on their way back to Scotland from exile in France. The village treated their royal guests so well that David II granted it the status of a Royal Burgh later that year. 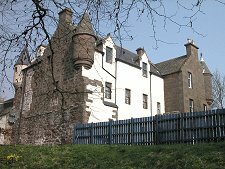 Inverbervie played no great role in Scotland's turbulent history over the next few centuries, though it is interesting to note that over this period a grand total of seven mansions or castles were built within 3 miles of the village. One of these, Hallgreen Castle, stands on a bluff overlooking the sea towards the southern end of the Inverbervie, now rather beleaguered by more recent housing development. Now a private home, it adds greatly to the interest of this part of Inverbervie. Fishing continued from the shelter of the mouth of the river for almost 500 years, and harbour improvements were made by Thomas Telford in 1819. However by 1830 a shingle spit had grown across the mouth of the river, making access difficult for boats. Fishermen based in Inverbervie moved the mile or so down the coast to the better harbour at Gourdon. By then Inverbervie had fortunately diversified. 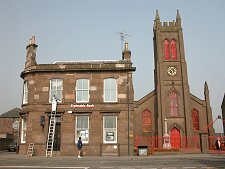 From 1787 it was the location of Scotland's first water powered flax mill: and textiles, thread and sailcloth helped the village prosper. Since it ceased to have an active harbour, Inverbervie has rather turned its back on the sea. 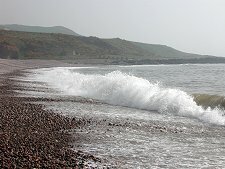 Bervie Bay is a curving pebble beach, built into steeply descending terraces by the vigorous action of the surf. Behind the shore is a fairly recent residential area, plus Inverbervie's leisure centre and the town camping and caravanning site. 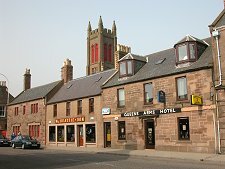 The main focus of the village is King Street, home to most of the shops and to the Bervie Parish Church. 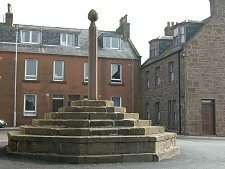 Towards its northern end is the Market Square, where you find a Mercat Cross dating back to 1737. As the A92 through Inverbervie leaves the village it crosses the river over the impressively curving, seven arched Jubilee Bridge built in 1935. 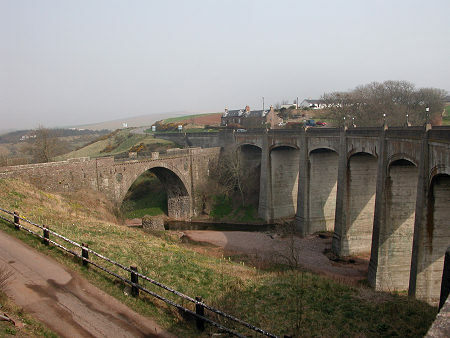 This replaced the Old Bervie Bridge, a 103ft single span built in 1799. The old bridge remains in place, still used by pedestrians, and converging dramatically at its north end with its replacement. Close to the south end of the Jubilee Bridge is the Hercules Linton Memorial. Hercules Linton, the designer of the Cutty Sark, was born in Inverbervie in 1836 in a house overlooking the Mercat Cross. 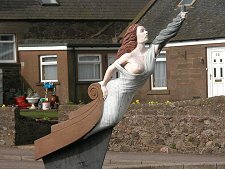 The memorial is in the form of a full size replica of the figurehead of the ship, the scantily clad witch Nannie from Robert Burns' poem Tam o' Shanter.